The human gut microbiome is a complex, highly-evolved commensal community with an integral role in your response to disease and how well you maintain homeostasis. While commensal bacteria vary from person to person, a person's specific microbiome should contain the same relative percentage of bacterial species over their lifespan. The balance of this community can be altered for weeks, months, and even years depending on diet, environmental factors, stress, and medications. Without proper gut microbiome function, host immunity and resistance to pathogenesis may be decreased, along with the ability to absorb key nutrients from the diet2. Broad-spectrum antibiotics are antibiotic medications that are effective against both gram-positive as well as gram-negative bacteria3. These antibiotics are commonly used when a bacterial infection is present, but there is a lack of time or resources and treatment needs to be administered immediately. Narrow-spectrum antibiotics have been shown to be effective when the bacterial genus or species is known. However, clinicians need to diagnose the offending bacteria rapidly and accurately before an infection becomes too severe. 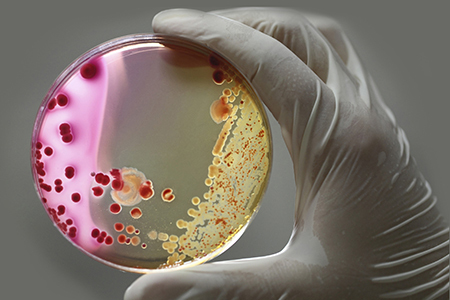 Clinicians need additional resources and training to understand what types of bacterial species can be targeted with narrow-spectrum antibiotics and when these can be effective4. One key example of antibiotic-induced microbiome disturbance is in patients who have been treated with clindamycin5. While clindamycin may effectively treat recurrent strep infections, diabetic foot infections, and the sexually-transmitted bacteria Chlamydia, its detrimental effects on the gut microbiome can result in the colonization of pathogenic bacteria such as Clostridium difficile6. Small amounts of C. difficile can exist in humans without apparent harm, but when antibiotic treatment wipes out beneficial gut bacteria, C. difficile can overgrow and lead to excessive diarrhea and colitis7. Additionally, long-term shifts (two years) in the composition of the gut microbiome have been found even after short-term (seven-day) administration of clindamycin8,9. Depending on the length of the antibiotic treatment, the age of the patient when administered, and the type(s) of antibiotics used, the short-term and long-term effects can differ in type and severity. Short-term effects are usually limited to the duration of the treatment and resolve within three months, while long-term effects can persist for up to two years past the antibiotic treatment8,10. 1. Sullivan, Å.; Edlund, C.; Nord, C. E. Effect of Antimicrobial Agents on the Ecological Balance of Human Microflora. Lancet Infect. Dis. 2001, 1 (2), 101-114. 2. Langdon, A.; Crook, N.; Dantas, G. The Effects of Antibiotics on the Microbiome throughout Development and Alternative Approaches for Therapeutic Modulation. Genome Med. 2016, 8 (1). 3. Ory, E. M.; Yow, E. M. The Use and Abuse of the Broad Spectrum Antibiotics. JAMA 1963, 185 (4), 273-279. 4. Melander, R. J.; Zurawski, D. V.; Melander, C. Narrow-Spectrum Antibacterial Agents. Medchemcomm 2018, 9 (1), 12-21. 5. Card, R. M.; Mafura, M.; Hunt, T.; Kirchner, M.; Weile, J.; Rashid, M.-U. ; Weintraub, A.; Nord, C. E.; Anjum, M. F. Impact of Ciprofloxacin and Clindamycin Administration on Gram-Negative Bacteria Isolated from Healthy Volunteers and Characterization of the Resistance Genes They Harbor. Antimicrob. Agents Chemother. 2015, 59 (8), 4410 LP-4416. 6. Smieja, M. Current Indications for the Use of Clindamycin: A Critical Review. Can. J. Infect. Dis. 1998, 9 (1), 22-28. 7. Bartlett, J. G. Antibiotic-Associated Diarrhea. N. Engl. J. Med. 2002, 346 (5), 334-339. 8. Jernberg, C.; Löfmark, S.; Edlund, C.; Jansson, J. K. Long-Term Impacts of Antibiotic Exposure on the Human Intestinal Microbiota. Microbiology 2010, 156 (11), 3216-3223. 9. Jernberg, C.; Löfmark, S.; Edlund, C.; Jansson, J. K. Long-Term Ecological Impacts of Antibiotic Administration on the Human Intestinal Microbiota. ISME J. 2007, 1 (1), 56-66. 10. Becattini, S.; Taur, Y.; Pamer, E. G. Antibiotic-Induced Changes in the Intestinal Microbiota and Disease. Trends Mol. Med. 2016, 22 (6), 458-478. ← Do you know what's in your water?